This gold making tip is quite unique. I haven't seen anyone else selling daily quests, and it has worked nicely for me. However this mainly works on small realms and in zones where no CRZ is enabled. Like the previous gold tip, this one too requires Engineering, one of the most profitable crafting professions in the game. Sure, there's more gold to be made elsewhere, but this takes no more than a minute! The money machine has more money to give! The concept of this gold making trick is simple. Obtain a Blingtron 4000, let people know that you have one and are willing to waste the cooldown for a little compensation. On a larger realm you will get replies like "I can do that too, for free", but on a small realm where there is no CRZ, such as Pandaland, there aren't that many other people in the same zones as you. Those without engineering also want the chance to get a free mount, pet or a crafting item worth 20k. Obtaining Blingtron 4000 is easy, as you can learn it from a trainer once you have 600 skill points in Engineering. Crafting it is not that expensive either these days. Once you are ready to pop the cooldown, you have to find a suitable zone (I don't recommend capital cities) and think of a sneaky macro that could bring you more profit. I'm not willing to reveal my favourite macro, but let people know that you're selling Blingtron 4000 Gift Packages and that they sometimes contain mounts, pets, super valuable crafting components and always contain items that are worth gold. They also get a cool 60 minute costume. I usually sell these for 100-300g and sometimes I get multiple whispers. My record is so far 6 deals from a single zone, but the zone was quite full, thanks to CRZ. Last day of the competition! Guess what's inside the treasure chest below, and either contact me via email or leave a comment below. If you guessed last time, you can now guess again! So far there has been only one correct answer, so I'll extend the competition a bit. The reward is shiny ingame gold coins on the realm of their choosing! If you guess right as well, the amount will be split. Click on the G +1 button and share this post or website on facebook by using the buttons on the left or below if you haven't already. Leave your best guess either below or via email! Tip: There is something wow related inside! Rules: Only 1 guess per person. No anonymous comments. Don't skip step 1, as should you win, I will verify the date of the share. The competition ends when the next gold making post arrives and your user name will be called if you participated via commenting below. Otherwise keep an eye on your mailbox! You can participate again in this post even if you have guessed in the previous post. 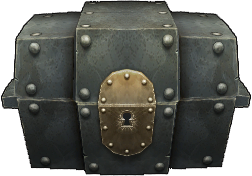 This chest will open tomorrow, be quick!